KISSIMMEE, Fla. – Jet lag wasn’t a problem for tie-down roper Haven Meged. Meged, 21, competed for Tarleton State University at a rodeo in Sweetwater, Texas, Friday morning and then hopped on a flight from Abilene, Texas, to Orlando, Fla., arriving at midnight Saturday morning to continue competing at the RAM National Circuit Finals Rodeo in Kissimmee, Fla., Saturday afternoon. 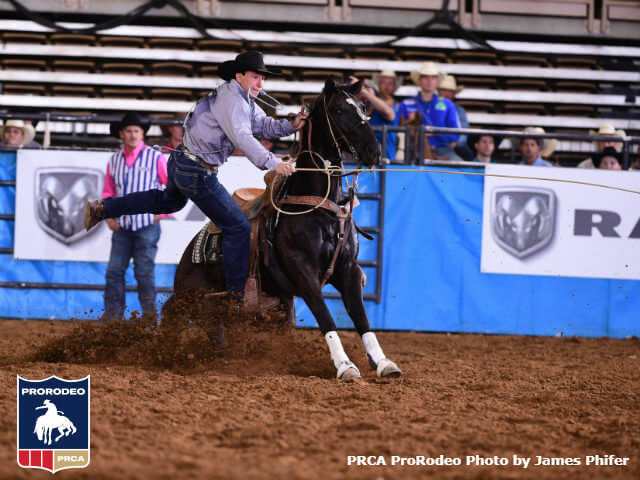 The whirlwind trip paid dividends as Meged clocked an 8.5-second run – the best of performance four – and secured a berth into the RAM NCFR semifinals by placing second in the two-head average with a 16.3-second time. The RAM NCFR concludes at 1 p.m. Sunday. The top eight contestants in each event compete in the semifinals and the top four in each event advance to the finals. At the RAM NCFR, Meged is riding his 9-year-old horse Beyoncé. “She has been really good for me,” Meged said. This has been a strong rookie season for Meged. He’s 10th in the latest PRCA | RAM World Standings with $26,954. At the San Antonio Stock Show & Rodeo in Bracket 3, Meged won the first round (8.8 seconds); split the win in Round 2 with 11-time Wrangler National Finals Rodeo qualifier Matt Shiozawa (8.5 seconds) and was third in the third round (8.1 seconds). Meged, of Miles City, Mont., is making his debut at the RAM NCFR representing the Montana Circuit after winning the year-end title. Tyler Bingham was thrown off his bull extremely hard in the first round. He shook it off to take second in the second performance with an 86-point ride on Stace Smith Pro Rodeo’s Bonanza. After a no score on his first horse, Isaac Diaz bounced back to post an 85-point ride on Korkow Rodeos’ Wiggle Worm to win the second round at the RAM NCFR. Diaz, who won the RAM NCFR last year, did his part and Wiggle Worm helped out. “I didn’t know if I had enough horse for it, but that horse had the best day its ever had,” Diaz said.